The Verschoyle Phillip Cronyn Memorial Archives at Huron College possesses a collection of primary sources and documents regarding John Jacobs, a nineteenth century Episcopal Priest. Jacobs was born in an Ojibwa family in 1845 in Fort Francis, Rupert’s Land, but moved to southwestern Ontario at a young age. He performed the role of missionary at the Sarnia, Kettle Point and Walpole Island Reserves from 1870 until his death in 1897. Records from his death report that he was very well-respected among the communities he worked in, and was considered a man of devout faith. 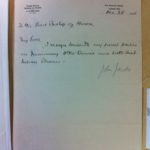 Among the archive’s collection on Jacobs are two documents that were hand-written by the reverend. The first is a record of sacraments and appointments in the church including baptism, confirmation, ordination and marriage. The second is a letter addressed to Rev. Dr. Cronyn, Lord Bishop of Huron informing him of his resignation from his missionary work in the Sarnia and Kettle Point Reserves. By examining other documents in the collection, it seems that Jacobs resigned from these positions to take up a new role in Walpole Island following the death of Rev. Jamieson. 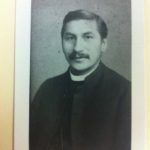 Transcribing clergy personnel records gives insight into the ways in which Ojibwa people became deeply integrated into Christian churches in the nineteenth century. Many of the assignments and research projects our group has been working on relate to missionary work, and the ways in which Anishinaabeg people contributed to these efforts. 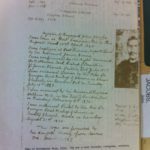 Investigating the archive’s clergy personnel records provides a good exercise in transcribing hand-written work, which will be useful when looking at rare book margin notes for our research projects. Rupert’s Land 22nd April 1845.
by the Reverend James Evans. I was ordained Deacon by the Rev. Dr.
on Tuesday, February 18th 1870. I resign herewith my present position as missionary of the Sarnia and Kettle Point Reserves.